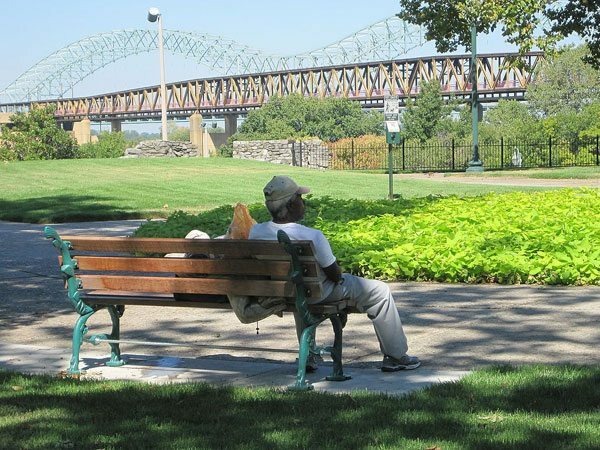 On Wednesday, two parks were freed by the City of Memphis to be sold. Both were bought by a newly convened nonprofit, and two Confederate statues in those parks came down as residents stood tearful witness. Many in Memphis, which is 64 percent Black, agreed that in preparation for the commemoration of the 50th anniversary of the killing of Martin Luther King on April 4th of next year, the two Confederate statues in the city’s parks should come down. Legally, though, the enterprise was complicated. Under the Tennessee Heritage Protection Act, the removal, relocation, or renaming of a memorial on public property is prohibited. Consequently, on Wednesday, the city council voted to sell those two city parks for $1,000 each to a very new private nonprofit called Memphis Greenspace. One of the parks hosted a statue of Confederate President Jefferson Davis, and the other a statue of General Nathan Bedford Forrest on horseback. The city completed the sale quickly, and those statues have now been secreted somewhere by the nonprofit, which removed them the same day the two properties were sold. A grassroots group called Take ’em Down 901 organized for public support, and the removals had been a pre-anniversary goal of Mayor Jim Strickland for some time. The statue of Forrest, a Confederate general and an early member of the Ku Klux Klan, came down at 9:01 p.m. in a nod to the city’s 901 area code, and Davis followed at 10:45 or so. “I was committed to remove the statues in a lawful way. From the beginning, we have followed state law—and tonight’s action is no different,” Strickland said. But the planning that went into Wednesday’s dramatic act of reconciliation was undertaken with speed, care, strategy, and public engagement in mind. The city council passed a law in September to allow Memphis to sell the parks for less than their market value. And Memphis Greenspace, which bought the parks and appears to exist only for the purpose of owning and caring for them, is led by Shelby County Commissioner Van Turner and only filed for incorporation in October. A popular local cause, the specialized entity has raised $250,000 from the public. Not everyone is pleased. Republicans in the Tennessee House have called for an investigation into whether “sunshine laws” had been violated, among other things. Additionally, local grassroots advocates do not believe that their leadership on the issue has been sufficiently acknowledged. Both issues remain to be addressed. For too many, blaming the victims of American racism for their hurt has replaced the search for a cure.